There’s rarely an instruction manual for these uniforms. Working out what’s best is all too much for me. I’ve jumped ship and tend to opt for wearing comfortable clothes that make a token gesture towards the uniforms. Not excelling in displaying any 0ne unifrom, but partially there with all that needs to be conformed-to for social acceptability. On a good day I’m slightly quirky. More often I exist somewhere in everyone’s experience of visually bland stylessness. This scribble was published on Monday, August 16th, 2010. You can follow any banter on this scribble with the RSS 2.0 feed. You can leave a response, or trackback from your own site. I think your being too hard on yourself. I was at a wedding on Saturday and one of my cousins was asking after you. He described the outfit you were wearing on the Dr Who tour, very cool! You’ve taken me back there with the photo though. 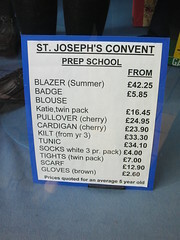 I actually went to a St Joseph’s Convent. Scary uniform, very scary! My outfit for the Dr. Who tour was an exceptioh, a deliberate step outside of bland. Stripey thigh-length socks with cargo shorts and desert boots are bound to be both noticed and memorable.